Constants – A symbol having a fixed numerical is called a constant. a, b, c , x, y, z ….. are variables. A combination of constants and variables, connected by ‘ + , – , x & ÷ (addition, subtraction, multiplication and division) is known as an algebraic expression. In a polynomial the largest exponent value of any given variable, that value is degree of that polynomial. Degree of a term is the sum of the exponents of its variable factors and degree of polynomial is the largest degree of its variable term. By adding or multiplying polynomials you get also a polynomial. While writing a polynomial in a standard form, put the terms with the highest degree first. 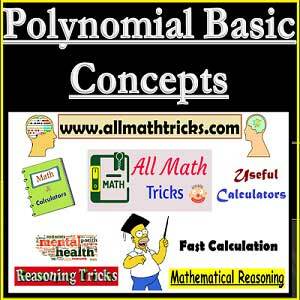 I Hope you liked this article about basic knowledge of polynomial functions;. Give feed back, comments and please don’t forget to share it. Many thanks for this educative lesson. Keep them coming, Sir!